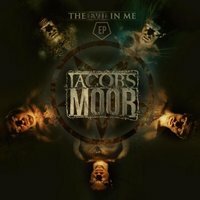 Austrian five-piece, JACOB’S MOOR, might be thrashers at heart, but they’re ones who have a more varied album collection than your average SLAYER-wannabe. Their latest EP, “The Evil In Me”, is essentially a short live record with a couple of new tracks added to the beginning, but despite the lack of new material, they show off a significant range of writing styles. Mixed up in the standard-issue fast paced riffs and squealing solos, are more sedate moments, oodles of melody, and a willingness to play with the standard formula, and it makes for an intriguing listen. First of the new songs is “The Evil In Me”, itself, a comparatively straightforward number that quickly escalates from a low-key build-up into a rampaging pit beast. There are chunky power chords blasting through it, a nice big chorus, and a genuine sense of urgency underpinning it all. Singer Richard Krenmaier doesn’t have the strongest growl in the world, but his clean vocals channel the spirit of Joey Belladonna and are a pleasing change to the usual snarl and barks of thrash. “Away” on the other hand, is an altogether different beast. It’s a lot more laid back, melodic, and seems to have been written with at least one eye on radio airtime. It almost feels like a Power Metal band trying to stretch their budget as far as possible and not quite managing to fully capture the epic vision they have in their heads, but it still works quite well. It’s drastically different from the title track mind, play the two back to back and it barely seems like they’ve been written by the same band. The rest of the track list is made up of live versions of songs that originally appeared on 2014’s “All That Starts” album. “Between The Lies” and “Faceless Man” are probably the best, both of them gnarly and aggressive Thrash anthems, although neither are essential listening, and if you already own the previous record, there’s no need to rush out and buy these. They do make the JACOB’S MOOR live show sound like loads of fun however, and even if this EP only appeals to established fans, it’s not a bad little release. They show off plenty of skill and ambition, and providing they work on the harsh vocals before the next album, they could one day become big hitters.